Welcome to our preview for Bijapur Bulls vs Bengaluru Blaster Final match. We are covering BIJ VS BB Dream 11 Team Prediction, Preview and Probable Playing XI for the final match. Bijapur Bulls ended third on points table with three wins and one loss. They won the semi-final in a dominating manner by 9 wickets. All bowlers bowled good spells. Naveen MG and KP Appanna took two wickets each while S Kamath and KC Cariappa also bowled brilliantly. B Chipli and Naveen MG made a match-winning partnership of 125 runs and therefore easily chased the target at loss of one wicket in less than 15 overs. Naveen MG scored 62* runs while B Chipli scored 73 runs. A similar performance will be expected from the teammates to lift the trophy of KPL2018. Bengaluru Blaster are in great form and finished on top of the points table in group stage. They won the semi-final by 20 runs. Their batting department could not put a good show. M Bhandage’s late cameo of 34 runs in 15 balls helped team reach a respectable total. Their bowling was perfect stopping the opponent at 118. S Gopal took brilliant three wickets while A Doddamani took two wickets. V Koushik, A Brar, C William also gave able support to them. They will hope to end their perfect tournament by winning the final. A brilliant encounter can be expected between both top teams buzzing with momentum to become the champions of KPL 2018. 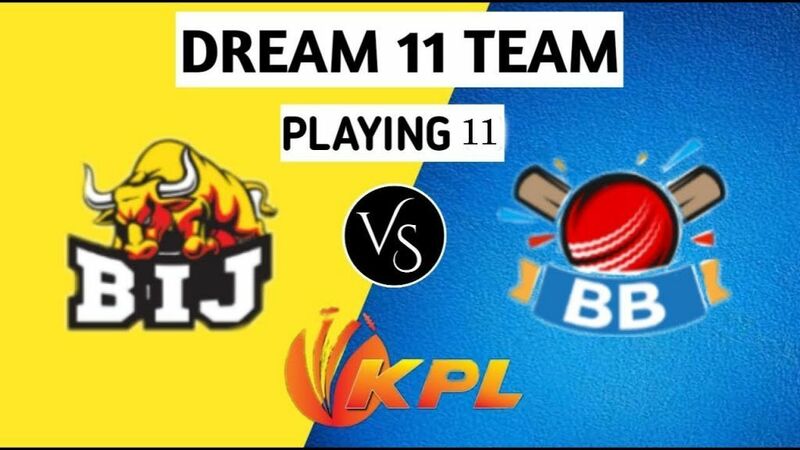 BIJ vs BB, Final, Karnataka Premier League, 2018. S.N. Raja Wadiyar Ground, Mysore, India. 6:30 PM IST, 6th September. BIJ: KP Appanna, Bharath Chipli, Ronit More, KC Cariappa, Suneel Raju, Naveen MG, KN Bharath (wk), Bhavesh Gulecha, Mir Kaunain Abbas, Zahoor Farooqui, Anurag Bajpai, Rishabh Singh, KL Shrijith, S Bhavane, S Kamath, B Naga, A Ghale, Rituraj B, Praveen Kr. BB: Prasidh M Krishna, Pavan Deshpande (R), Mitrakanth Yadav (R), Abhishek Bhat (R), Vishwanath M , Rohan Raju, Koushik V (R), S Gowda, A Doddamani, P KR Das, M Bhandage, A Singh Brar, B Devraj, V Yadav, G Dhiman, KC Avinash, KB Pawan, A Ghatankar. are expected in the playing XI. Pavan Deshpande, Abhishek Bhat, Mitrakanth Yadav, Koushik V are the retained players. No changes are expected in the playing XI. R Uthappa, KB Pawan and P Deshpande will be the key batsmen. M Bhandage, M Yadav, A Brar, A Bhat and S Gopal will also provide able support in batting department. A Doddamani, S Gopal, M Yadav will lead the spin attack along with A Brar. M Bhandage, V Koushik and A Bhat will be the main pacers. C William can support them. All are in good form. BIJ: Naveen MG, Bharath Chipli (c), Shishir Bhavane, Mir Kaunain Abbas, KN Bharath, KL Shrijith (wk), Suneel Raju, KP Appanna, Suraj Kamath, B Gulecha, KC Cariappa. BB: KB Pawan (wk), R Uthappa (c), Pawan Deshpande, Arshdeep Singh Brar, Manoj S Bhandage, Mitrakant Yadav, Abhishek Bhatt, S Gopal, C William, A Doddamani, Kaushik V.
B Chipli, G Naveen, R Uthappa, S Gopal, P Deshpande.